Germany hosts a very large and important gold market, however there is no centralised physical gold exchange in the country, and although some gold futures trading products exist, these are minimal. The German gold market is therefore predominantly decentralised and primarily consists of the interaction of banks, gold refineries (which also trade gold), large nationwide gold wholesalers and distributors, and smaller regional and local precious metals retailers. German banks are critical to the German gold market. Nearly every bank in Germany buys gold and offers gold for sale to its own private customers. Some German banks also act as gold wholesalers. The German bank entities active in the gold market include the state-owned regional banks known as Landesbanks (or Landesbanken), the Sparkassen (savings banks), the Volsbanken and Raiffeisenbanken (co-operative banks), and the commercial and investment banks such as Commerzbank. Landesbanken are owned by state governments but also count savings banks among their shareholders. There are currently 8 Landesbanken in Germany. All of these Landesbanks sell gold to the savings banks in their respective regions, however, 3 of these Landesbanks, namely Bayerische Landesbank (Bayern LB), Landesbank Baden-Wurttemberg (LBBW) and Landesbank Hessen-Thüringen (Helaba), also act as distributors/wholesalers to other wholesalers, banks and retailers in the wider gold market as well as supplying gold to the savings banks in their respective regions. Bayern LB, headquartered in Munich, is one of the largest physical gold dealers in German-speaking countries and has relationships with gold refineries worldwide. Bayern deals in over 800 precious metals products, supplies gold and other precious metals to German Sparkassen and Volksbanken, and supplies gold directly to retailers and private and institutional investors. 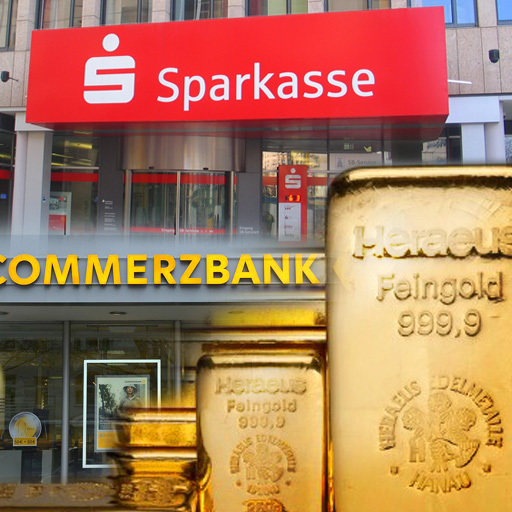 Gold bars supplied to the Sparkassen are typically stamped with a ‘Sparkassen-S’ logo. Bayern LB also offers its own customers precious metal savings plans (combi-system savings) and ‘gold ounce accounts’ for accumulating gold, and it even purchases scrap gold from the public. Landesbank Baden-Wurttemberg (LBBW), headquartered in Stuttgart, is also a wholesaler of gold to the wider market and is actively involved in offering physical gold to its own customers, as well as to its Sparkassen banks. HeLaBa, headquartered in the cities of Frankfurt and Erfurt, is the third of the Landesbanks to act as a wholesaler of gold to the external market, as well as distributing gold to its own savings bank and other customers. Bayern LB and LBBW are both Ordinary members of the London Bullion Market Association (LBMA). Outside of Germany, Bayern maintains international offices in cities such as London, New York, and Paris. LBBW’s international offices include subsidiaries in London and Zurich. Apart from Bayern LB, LBBW, and HeLaBa, the other Landesbanken are Nord LB, Bremer LB, Landesbank Berlin (LBB), Landesbank Saar (SaarLB) and HSH Nordbank, and these Landesbanks only supply gold to the Sparkassen in their own regions. Reisebank, a subsidiary of DZ Bank and part of the BVR group, supplies gold products to the Volsbanken/Raiffeisenbanken, and is one of the top 3 gold dealers in Germany. Reisebank’s gold supply network therefore encompasses all of the cooperative banks in Germany (more than 1,200 banks) as well as its own customers (over 100 branches and an online store). Among the large German commercial banks, Commerzbank and Deutsche Bank are important participants in the German gold market. Commerzbank states that it is among the top 3 bullion banks in the world, and it’s also an Ordinary Member of the LBMA. Although Commerzbank’s gold trading business is headquartered in its Luxembourg office ( with additional trading desks in New York and in Singapore), the bank is classified here as part of the German market since Commerzbank is a German headquartered bank. Commerzbank is also one of the three outside shareholders in Swiss precious metals refinery Argor–Heraeus along with Germany group Heraeus and the Austrian Mint. This connection with Argor-Heraeus naturally allows Commerzbank to supply Argor-Heraeus products. Deutsche Bank made headlines in 2013 and 2014 due to winding down some of its precious metals trading activities in London and elsewhere, and the bank is no longer a member of the LBMA. However, Deutsche Bank is still involved in the German gold market and it still sells gold to its own customers as well as to some smaller banks. Additionally, Deutsche Bank is still an authorised representative for a number of the well-known mints and refineries, including South Africa’s Rand Refinery. Munich headquartered Hypovereinsbank (HVB), also known as UniCredit Bank AG (since it’s a subsidiary of Italian Unicredit SpA), sells gold to its own customers. ‘Private banks’ involved in wealth management, such as Hauck & Aufhäuser and Bankhaus Lampe can facilitate gold transactions for their own clients, sometimes in conjunction with German gold wholesalers. Examples of large non-bank wholesale gold distributors and sellers in Germany are Ziemann Valor, Pro Aurum and ESG Edelmetall. Ziemann Valor, part of the Ziemann Gruppe secure logistics company, is a German precious metals wholesalers for German banks and coin dealers. It also offers an online precious metals store. Pro Aurum is a German based non-bank precious metals dealer and retailer with outlets in Berlin, Munich, Hamburg and Stuttgart, and a presence in Dresden, Dusseldorf, and Bad Homburg. Outside Germany, Pro Aurum has branches in Zurich and Lugano in Switzerland, Wien in Austria, Ostrava in the Czech Republic, and it maintains a presence in Hong Kong. ESG Edelmetalle, located in Rheinstetten, near Karlsruhe is a scrap precious metals refiner and producer, and the inventor of the well-known gold Combibar. The Combibar is produced under license by refiner Heimerle + Meule in the German and Austrian markets, and by the Valcambi refinery (Switzerland) for all other international markets. ESG is also a trader in gold, and operates a gold wholesale and retail sales portal. Degussa is one of the well-known national gold retail networks in Germany, and it also operates international branches. Degussa is unusual in that it also owns its own recently acquired precious metals refinery. Degussa’s head office is in Frankfurt, and it has branch offices in Berlin, Cologne, Hamburg, Hanover, Munich (2 branches), Nuremberg, Stuttgart, and Pforzheim, as well as in Zurich (Degussa Goldhandel AG), Geveva, Madrid and Singapore. Degussa also owns the London-based gold dealer Sharps Pixley. Degussa (listed as Degussa Sonne/MondGoldhandel Gmbh) is an Associate of the LBMA. Historically, Degussa operated a precious metals refinery in the German town of Hanau, just outside Frankfurt. In August 2014, Degussa acquired another precious metals refinery in the town of Pforzheim in southwest Germany. Pforzheim is located between the cities of Karlsruhe and Stuttgart and is known as GoldStadt (Golden City) due to its historical associations with the German jewellery and watch-making industries. Degussa’s new refinery processes scrap precious metals, and produces inputs for the jewellery sector. MP Edelmetalle is a precious metals retailer with offices in Köln, Düsseldorf, Hannover, Wiesbaden and Siegen. Another point to note it that a lot of participants in the German gold market also have connections to other German-speaking markets, i.e. Switzerland and Austria. For example, Bayern LB is active in other German-speaking markets apart from Germany. Commerzbank, Heraeus and the Austrian Mint together are the outside owners of the Argor-Heraeus refinery. Heimerle + Meule has a subsidiary in Austria. Pro Aurum has branches in Switzerland and Austria and Degussa has branches in Switzerland. It’s useful to highlight which German entities act as authorised distributors or representatives for international Mints and gold refineries because this signifies which German companies these international Mints and refineries choose to partner with. The authorised international dealers list of South Africa’s Rand Refinery includes Deutsche Bank, Bayerische Landesbank and Landesbank Baden-Wurttemberg and also Degussa and Pro Aurum. In Germany, the Austrian Mint partners with Bayern LB, Helaba, Reisebank, Deutsche Bank, Pro Aurum, and Degussa among others. Australia’s Perth Mint lists Bayern LB, LBBW, Helaba LB, and Deutsche Bank as national wholesalers of its bullion coins in Germany. The Royal Canadian Mint lists 2 distributors in Germany, namely GfM, and MDM Deutsche Munze. Both of these companies are specialists in coins and numismatics rather than being purely specialised sellers of investment grade precious metals bar and coins. Heraeus and Agosi are Associates of the LBMA. Other precious metals refineries in Germany include Degussa’s refinery in Pforzheim and ESG Edelmetalle’s refinery in Rheinstetten, near Karlsruhe (also near Pforzheim). Degussa’s previous refinery was on the LBMA Good Delivery List, but was removed in 1999. Doduco operates a refinery in Pforzheim and is an Associate of the LBMA and is on the LBMA Good Delivery List for silver, but not for gold. Heraeus is the most important precious metals refinery in the German market, followed by Umicore, and the Swiss refinery Valcambi. German refineries only sell gold investment products to wholesalers, the exception being Degussa which is beginning to produce own brand gold bars for its own retail outlets. All Germany refineries also trade gold through their in-house trading desks. Heraeus is active in precious metals recycling and has precious metals trading teams in Hanau (Germany), New York, Hong Kong, and Shanghai. The Heraeus gold bar range can be viewed on the company’s website. Private investors cannot purchase Heraeus gold bars directly from the refinery, but can purchase bars via large banks, savings banks, and from precious metals dealers. “Allgemeine Gold – und Silberscheideanstalt”, now known as “AGOSI” is part of Belgian headquartered refining group Umicore. Agosi specialises in precious metals recycling and scrap refining. C Hafner operates a gold refinery in Pforzheim, and runs a gold trading business as well as manufacturing an extensive range of investment bars. Heimerle + Meule refines and trades gold and also produce its own range of investment gold products. Aurubis primarily refines copper from primary and secondary raw materials, but has a small gold output since gold is present in primary copper raw materials and in scrap such as electronic scrap. Aurubis only produces 400oz good delivery bars and only sells these bars to commercial customers. Commerzbank and Heraeus are two of the three outside shareholders in Argor-Heraeus of Switzerland, the other non-Swiss shareholder being the Austrian Mint. Most of the gold arriving into and leaving Germany does so by air via Frankfurt International Airport using Brinks and Loomis (formerly Via Mat). Loomis has its headquarters in Frankfurt, and Brinks is headquartered in Frankfurt airport and in Munich airport. Within Germany, for transportation of precious metals, Prosegur has the largest share of the market (Prosegur acquired the cash and valuables business of Brinks within Germany in 2013). Other security transportation companies in Germany include Ziemann Gruppe, headquartered in Schallstadt, and Malca Amit, headquartered in Cologne. There are a number of physically gold-backed Exchange Traded Commodity (ETC) products listed on German securities exchanges such as the Xetra-Gold, EUWAX Gold, and Deutsche Bank db Physical Gold ETCs. There are also gold futures and options contracts listed on the Eurex derivatives platform which are based on the USD gold price and the Xetra-gold ETC, but these Eurex derivatives products are not widely traded. Two gold futures contract products are listed on the EUREX derivatives exchange. EUREX is operated by Deutsche Börse. Gold futures (code FGFX), (ISIN – DE000A0V75H3) is a cash-settled contract for 100 troy ounces of gold, traded in USD, whose underlying asset is ISIN XC0009655157. This underlying is gold in US Dollars, quoted on Deutsche Bourse. The second EUREX listed gold futures product is ‘Xetra-Gold® Futures’ (code FXGL) (ISIN DE000A1EY8V9). This is a futures contract on the ‘Xetra-Gold’ ETC, quoted in EUR. The ISIN of Xetra-Gold is DE000A0S9GB0. EUREX also lists gold options (code OGFX) (ISIN DE000A0SNHA8), quoted in US Dollars, with the same underlying asset as the FGFX gold futures, (i.e. gold in US Dollars, quoted on Deutsche Bourse – ISIN XC0009655157). Finally, EUREX, also lists options on ‘Xetra-Gold®’ (code OXGL) (ISIN DE000A1EY8W7), quoted in EUR. The underlying asset on these options is Xetra-Gold (i.e. the same underlying as the Xetra-Gold futures. ‘Xetra-Gold’ is an Exchange Traded Commodity (ETC), structured as a bearer bond, which trades on Deutsche Borse’s Xetra electronic trading platform and is offered to residents of Germany, Austria, the Netherlands, Luxembourg and the UK. This ETC (ISIN: DE000A0S9GB0) is 100% backed by physical gold and is denominated in Euro per gram. Each unit represents one gram of gold and the right to receive that gold, traded on the Xetra trading platform. The gold that backs Xetra-Gold is stored in a vault under the custody of Clearstream Banking Frankfurt. Clearstream is a subsidiary of Deutsche Börse. Precious metals refinery Umicore AG supplies the gold that’s held in the Xetra-Gold ETC. Holders of Xetra-Gold units can also request delivery of their ETC entitlement in physical gold. The issuer of Xetra-Gold is Deutsche Börse Commodities GmbH, which is a joint venture between Deutsche Börse AG and Commerzbank. Commerzbank, along with Deutsche Bank, DZ BANK (parent of Reisebank), B. Metzler seel. Sohn & Co, and Swiss based Bank Vontobel, are placement agents for Xetra-Gold. As of the end of October 2015, the Xetra-Gold ETC was backed by 60.3 tonnes of gold. The gold bar holdings of the Xetra Gold ETC can be viewed on the Xetra Gold website. EUWAX Gold is an Exchange Traded Commodity (ETC) ((ISIN DE000EWG0LD1), structured as a bearer bond, and listed on the Stuttgart stock exchange. EUWAX Gold, quoted in Euro, is 100% backed by physical gold, with the right of physical delivery. The gold in this ETC is stored in vaults in Germany, using Clearstream Banking as the depository, and physical delivery of the underlying gold is possible in the form of 100 gram bars (equivalent to 100 bearer bonds), and also as 500g and 1kg bars. Delivery points are listed on the product’s website. The trading price of EUWAX Gold is based on the LBMA Gold Price. A relatively small 3.5 tonnes of gold was held in EUWAX gild as of January 2016. Deutsche Bank offers the Deutsche Bank db Physical Gold ETC. Although this is technically a German product, the underlying gold is stored in the vaults of JP Morgan, London. According to the World Gold Council, Germany recorded total gold bar and coin demand of 101.6 tonnes in 2014, down from 117 tonnes in 2013. For 2015, the World Gold Council estimated that Germany’s gold bar and coin demand reached 113.8 tonnes. These demand figures are the highest for any country in Europe (and over twice the bar and coin demand coming out of Switzerland), and highlight the huge appetite for investment gold by the German public. Correspondingly, German gold jewellery demand was 10 tonnes per annum in both 2014 and 2015. Germany has the distinction of holding the 2nd largest official sector gold holdings in the world, with reported holdings of 3,381 tonnes. These gold reserves are managed and maintained by the Deutsche Bundesbank on behalf of the German nation. Since late 2012, Germany’s gold reserves have arguably generated more media interest and scrutiny than all other central bank gold holdings combined due to a gold repatriation process which the Bundesbank commenced for transferring part of its gold holdings from abroad back to its Frankfurt headquarters. This repatriation program has the dubious distinction of probably being the slowest gold repatriation operation in history, and has left the Bundesbank open to ridicule in the way that it has handled and continues to handle this go-slow transport operation. The repatriation program itself was prompted in part by concerns from German lawmakers and the German Court of Auditors over the lack of transparency surrounding the Bundesbank gold inventory records and those of its foreign gold custodians, and also similar transparency concern from German citizen groups. Like many official sector gold holders, as Germany accumulated gold holdings during the 1950s and 1960s using US Dollar surpluses, these gold holdings became geographically distributed among various storage locations abroad under the custody of Bank of England in London, The Federal Reserve Bank of New York (FRBNY), and the Banque de France in Paris. In the first year of operation of the repatriation scheme during 2013, the Bundesbank transferred a meagre 37 tonnes of gold in total to Frankfurt, moving 5 tonnes from the FRBNY and 32 tonnes from Paris. The Bundesbank Bundesbank directed that the 5 tonnes from New York be melted and recast into London Good Delivery bars, suggesting that these bars were either low-grade coin bars or else US Assay Office bars that the Bundesbank did not trust the assay on. In 2014, the Bundesbank transferred 120 tonnes of gold in total back to Frankfurt, with 85 tonnes being moved from New York and 35 tonnes from Paris. Of the 85 tonnes of bars moved from New York, 50 tonnes of these bars underwent a melting and recasting process, again suggesting lack of confidence by the Bundesbank in the US bar quality. In 2015, the Bundesbank brought back 210 tonnes of gold to Frankfurt, with 110 tonnes being repatriated from the Banque de France and circa 100 tonnes being transported from New York. It’s also worth remembering that in reaction to initial political and auditor pressure in 2012, the Bundesbank originally had planned to repatriate 50 tonnes of gold per year in each of 3 years from New York over the 2013-2015 period, but this original plan was shelved when it seems to have become apparent to the Bundesbank that it would not be able to receive back 50 tones from the FRBNY during 2013. This original plan is detailed in a report by German Newspaper Spiegel in October 2012. There has also been controversy over the Bundesbank’s attempts to improve transparency within its gold bar records. In October 2015, the Bundesbank released a number of details of its gold bar holdings in the form of a partial gold bar weight list. But this list did not contain industry standard weight list details such as refiner name of each bar and year of manufacture of bar, which only fuelled concerns that the Bundesbank has reasons not to publish an industry standard gold bar inventory list. With approximately 1,400 tonnes of Germany’s gold now stored at the Bundesbank’s storage site Frankfurt, this in itself is one of the largest single stockpiles of gold in the world and places Frankfurt as a strategic gold storage centre. Some video footage of this gold storage location can be seen on the Bundesbank’s website. The internationally known ‘World Money Fair’ is held each February in Berlin. Now in its 46th year, the World Money Fair attracts precious metals refineries, mints, wholesalers and retailers from around the world as exhibitors and as attendees, but most importantly as commercially minded dealmakers. Meetings are organised, inventories discussed and new relationships cultivated. That the German public also hold the distinction of generating the single largest annual investment gold demand of any country in Europe, at over 100 tonnes per annum, is itself somewhat of a phenomenon, and may well highlight the astute generational memory of the German population in understanding gold’s benefits as the ultimate store of value and safe haven asset. It is perhaps fitting then that this international exhibition/convention takes place in the capital city of one of Europe’s and the world’s most vibrant gold markets.